The Honda CR-V was one of the first crossover cars to be launched in India. It was launched in early 2003 and was Honda’s third car in India. This car was more like a saloon to drive rather than been a SUV as its look suggest. In short terms, it was a Honda Accord on stilts. Its raised height means that it can tackle some of the off roads as well but beware that this car isn’t that suited for the off-roads. It is more of an urban player. Earlier on, the Honda CR-V in India was more of a status symbol rather than just been a mode of transport. It was the favourite of all the politicians and hoodlums as well. It is also touted as one of the easiest cars to live with and drive. Its light steering controls make it one of the best handling SUVs this side of BMWs. Its dimensions were compact enough for it to fit in most of the jammed parking spaces. Earlier Honda CR-Vs had a dark interiors whereas the ones after 2004 featured beige interiors. The beige ones looked more cheerful than the all dark ones. 40,000 kms is the mark wherein the tyres for the Honda CR-V last upto. Do check if the mileage of the car and also the tyre condition match. If they don’t be ready to question the dealer or the seller. If the front or rear suspension emits a clunky sound, it means that the suspension mounts are worn out. It is just a minor repair job and just involves replacing and tightening the bushings. But what is not inexpensive are the spare parts. Just the boot lid and front door would cost upto Rs 40,000 to be replaced. The head light assembly itself would set one back by Rs 14,000. Regular replacement items like the fuel filter would cost Rs 1,300. The air and oil filters would be Rs 1,100 and Rs 700 respectively. Honda been Honda charge a premium for everything. The Honda CR-V features shift on the wheel 4 wheel drive system. This means that it is front wheel drive however when the car’s electronics detect rear wheel slippage, power is split between the front and rear wheels. If you are looking for a 4×4 for off-roading jaunt vehicle, the Honda CR-V is best avoided. It’s handling prowess as a SUV is legendary. It is the current benchmark as far as ride and handling in the soft roader department go. Body roll is also minimal and infact less than some of the sedans. The engine trims for the pre 2004 Honda CR-Vs was a 2.0 liter engine which was good for 138 Bhp. Later on, the Honda CR-V in India was offered with a 2.4 liter petrol engine which makes 153 Bhp and is the same engine been offered even now. There is no dearth of power in any of the engines however it is our personal advise to go in for the 2.4 liter engine since the spares for it would be quite readily available now. The interiors also wear well with age and there should be the occassional Honda CR-V with a worn out gear lever without the markings. As is the case with all Honda vehicles, this one also has a bullet proof engine and reliability is also legendary. The automatic gearbox is also very efficient in its operation. Wind and road noise are also well contained in this car and hence it shouldn’t be a problem for the passengers. The petrol engines by virtue of been silky smooth also are NVH free. The steering though not as communicative is light however its tie rod ends have been known to create problems for the pre 2004 version. It would be advisable to check if there is any steering oil leak and if so detected, would end up in an expensive repair thing. The seats are comfortable both front and back. The hatch is also spacious and can accommodate upto 500 liters of luggage. Regular engine oil change, servicing should ensure miles of comfort driven ownership experience in a used Honda CR-V in India. Expect fuel economy to be around 7 kmpl in the city and 11 kmpl on the highway. Running costs would definitely be higher based on the fact that the used Honda CR-V in India would come only in petrol trim. Not many examples of a used Honda CR-V in India would abound however the best place to look for one is Honda’s own dealerships. They have a certified pre owned vehicle program and this would ensure that you have some months of trouble free ownership experience. Sure the dealerships would charge a premium than what you would find in some other reseller stores but the premium paid would be well used. The used Honda CR-V price from the 2003-2006 batch would hover around Rs 6.5 lakhs to Rs 10 lakhs. Post 2006 models were face lifted and would have a hefty price tag upwards of Rs 12 lakhs. 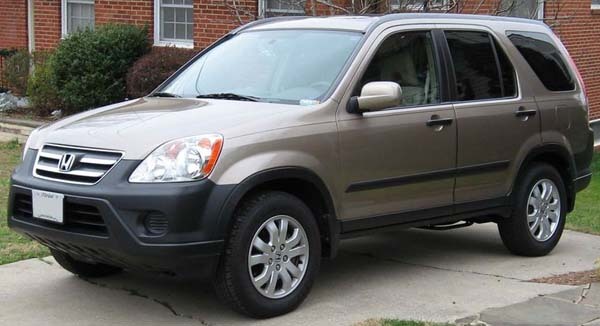 The price of a used Honda CR-V would however vary on the mileage and condition.